As I have explained, buying structured settlement payments from a factoring company to sell to investors, you can reap a nice profit along the way. An illustration of profits from structured settlement annuity payments you can see in this PDF future annuity payments spreadsheet. 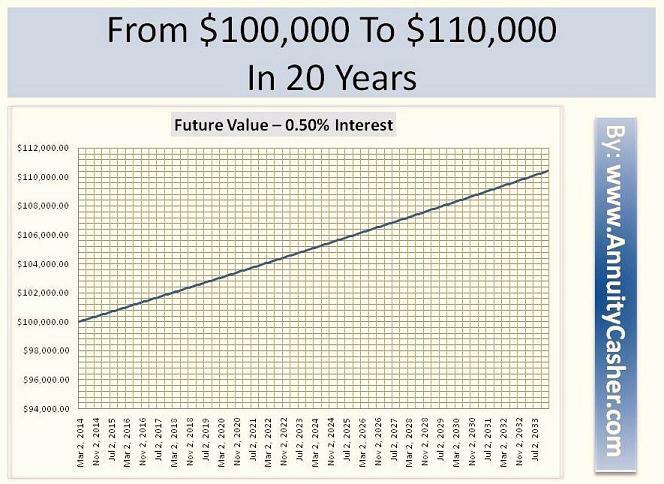 The table illustrates the future value of a structured settlement of $100,000 at a meager half a percent interest yield. Due to the long duration, the yield and compounding (it's based on monthly gains), even at this small percent, the settlement that spans 20 years will yield a profit of over $10,000.00. Can you imagine that? If your first thought was that .050 percent is only $500,00, take a close look at the table and you'll now understand the power of future value and compounding. It's 20 times as much. However, as the intermediary, you don't wait for the structured settlement payments streams to profit. You get paid your share now by the investor who's buying it from you. The structured settlement payments (or "inforce annuities," as they are sometimes called) rights are then taken over by the investor who will profit in the future from the periodic cash flows. The profits of the end buyer will be much more than the low interest yield of the original holder of the structured settlement. This is due to the discount rate at which it was cashed out by the factoring company who sold it to you, the intermediary. The spreadsheet illustration is based on an actual structured settlement case, but the numbers and the discount rate have been altered for our purpose to illustrate profits for a structured settlement "broker" even with a narrow profit margin. Of course, not all structured settlement payments structures are alike, and in fact every case is unique and settlement are very flexible at the time of the set up, although they are locked in afterwards and can't be changed then. In this illustration, I have also taken out a number of periodic lump sums to simplify the demonstration, and I changed the payouts, but I have so stress as well a very important issue, that in that particular case the annuitant has chosen not to take any fixed smaller periodic payments on a steady basis, but only after every few years some lump sums in larger amounts. What I have done here, is I took it all out, and you don't see periodic payments at all. You may think that it does not as realistically reflect a typical case and after all it's not "periodic payments," but my purpose here was only to illustrate the profits potential even at a think spread. The particular illustration would change dramatically if payments would have been issued periodically. These would have been cash "outflows," and it means that only what has not been withdrawn as yet will keep accumulating interests, so the sum of the profits of all future payments will amount to less. However, I hope you get the idea. Agree? Disagree? Please add your comments here.